Amy Marcy Cheney Beach (1867-1944) was a prolific composer of music for piano, voice, orchestra and choir. Her early piano works, those written up to 1894, are presented in the first volume of this set of discs. The second disc in the series contains those works composed at the end of the 19th century and beginning of the 20th, and the third disc is of Beach’s pieces for piano from 1907 to 1924. This volume contains Beach’s final opuses for the piano. Amy Beach’s affinity with the piano as a performer comes through in her writing of Nocturne, op. 107. Naturally pianistic, the piece opens on the dominant octave and takes four bars of progression using seventh chords, diminished and augmented harmonies to arrive at E major. The melody is introduced in the middle voice with low bass notes tolling the first beat of the bar and supporting chords on the second half of each beat. Beach moves the melody between the voices, building to an appassionato climax of full chords in both hands, making this a very wakeful “night piece” indeed! The dreams or passions of the night having subsided, the piece ends quietly in slumber. Tyrolean Valse-Fantaisie, op. 116, was begun in the Tyrol in 1911 and completed in Munich in 1914. It was performed in Boston in December 1914 upon Beach’s return from Europe, and was published later in 1926. The piece begins in descending unisons, the bare bones of the fantasy melody, which soon emerges pianissimo in the right-hand. Beach explores this simple motif sequentially, using extended harmonies and chromatic decoration. This improvisatory section ushers in the waltz melody, related to the opening fantasy melody in the descending minor third outlined by the upper notes. The second waltz melody, marked più vivace, is the folk song, ‘Kommt ein Vogel geflogen’. The two melodies are then combined, with the first waltz in the right-hand and the second tune in the left. The third folk song in this quasi-rondo form of waltz melodies is ‘Rosestock Holderblüh’. This melody is introduced on its own, then combined with ‘Kommt ein Vogel geflogen’, before the return of the first melody (combined also with ‘Kommt ein Vogel geflogen’). Other combinations between the hands of the second and third waltzes bring this section to a close. After a pause, Beach writes a grandiose section of full chords and octaves on a motive derived from the ‘Kommt ein Vogel geflogen’ melody. This grand motive is developed harmonically and leads to a passage around the opening fantasy figure. ‘Kommt ein Vogel’ is heard once again, accompanied by trills this time, before the music returns to the expansive chordal melody for more development. The opening material reappears, now introducing the coda — a masterfully constructed tour-de-force which includes all the main waltz themes in a final dance frenzy. Beach had a long-term relationship with the MacDowell Colony, spending much happy time composing in Peterborough, New Hampshire. The Alexander Studio, one of the retreats there, provided inspiration for the Old Chapel by Moonlight, op. 106 (pub. 1924). Crafted in stone, with arch windows and doorway, the building sits in the wooded landscape much as the simple chorale tune which comes in the middle of the piece sits amongst the elegant parallel seventh chords which form the opening and closing sections. Published in 1924, A Cradle Song of the Lonely Mother, op. 108, is just that: a lullaby of a mother who is lonely, caring for her baby on her own. The rocking left-hand accompaniment acts as ostinato for the melody which Beach develops freely in the right hand. This undulating motion subsides and the middle section of the piece emerges ppp. A lovely pattern of two notes in the left hand against three in the right supports the new melody in the middle voice. Trills usher in the return of the opening theme, which becomes fuller and more decorated. The melody of the middle section returns as the coda to a most atmospheric piece of writing. Written in 1925, By the Still Waters, op. 114 refers to Psalm 23: “The Lord is my shepherd; I shall not want. He maketh me to lie down in green pastures: he leadeth me beside the still waters….” Beach was baptized into the Episcopal church in 1910 several months after her husband’s death. She wrote, “the greatest function of all creative work is to try to bring even a little of the eternal into the temporal life….” This piece is a tranquil portrayal of the still waters of Psalm 23 and the reassurance which comes later in the Psalm of one’s soul being restored, with no fear of evil, and goodness and mercy pervading the rest of life. In 1922 Beach and two other teachers started a Beach Club for children in Hillsborough, NH, with the support of the Hillsborough Music Club. The children played for one another, Beach listened to them and played for them herself. She dedicated From Six to Twelve, Op. 119 no. 1-6 (published 1927) to “the Junior and Juvenile Beach Clubs of Hillsborough, N.H.” The pieces are character studies, with the titles indicative of the music which follows. The first and last, ‘Sliding on the Ice’ and ‘Boy Scouts March’ are in rondo form, with lively patterns depicting frolicking children on the ice and marching jauntily in step respectively. ‘The First May Flowers’ is a simple waltz in ABA form. ‘Canoeing’ conveys the gliding of a boat through water with the melody in longer notes surrounded by the moving water of broken chords. ‘Secrets of the Attic’, in three-part form, has outer sections which whisper ‘I have a secret…’, and a middle section which insists it won’t divulge the secret no matter what! ‘A Camp-fire Ceremonial’ is solemn, with a low A gong sounding under the still chordal melody of the first and last sections. The middle section of the piece is perhaps the rite itself, conducted in moonlight in a circle around the campfire. Beach made her second European tour in 1926-1927, beginning in Italy and finishing with six weeks in Paris. A Bit of Cairo, published in 1928, bears witness to the effect of this visit, with allusions to Debussy’s Golliwogg’s Cake-walk in the main theme and stylised accompaniment. Undoubtedly Beach was also influenced by seeing the Egyptian treasures at the Louvres, and also perhaps by the success of the Harvard University-Boston Museum of Fine Arts Expedition to Egypt in 1927, as she develops the opening jaunty theme through a myriad of keys. A September Forest was most likely composed in 1930 during a stay at the MacDowell Colony. The rising theme of the opening bars paints the picture of a quiet, beautiful woodland haven. The MacDowell Colony was this for Amy Beach – a retreat where she could reflect, compose and relax. The serenity and inner peace she must have felt there is revealed in the hymn-like melody which comes halfway through the piece. This melody builds to a ff climax of grandeur with full chords and resonating bass octaves. It then winds down to a simple restatement of the opening woodland theme. Beach used A September Forest as the basis for Christ in the Universe, op. 132, a vocal work with orchestra. Three Pianoforte Pieces, op. 128, and Out of the Depths, op. 130 were both written at the MacDowell Colony in June 1928. The Three Pianoforte Pieces, op. 128 are dedicated to Marian MacDowell, wife of composer Edward MacDowell and good friend of Amy Beach. The pieces are reminiscent of the woods in Peterborough, New Hampshire, where the MacDowell Colony is located. Beach herself performed the pieces for Eleanor Roosevelt at a White House Concert in 1936. The first, Scherzino: A Peterboro Chipmunk, is a character piece with an energetic chipmunk scampering to and fro, up and down, in and out of tree branches. The second, Young Birches, impressionistic in use of parallel fourths and extended harmonies, paints a picture of the breeze caressing the leaves of the birches, shimmering and calm. A Humming Bird finishes the set, with Beach using fast notes between the hands to capture the little bird flitting from flower to flower, collecting nectar in a blaze of colour. Out of the Depths, op. 130, carries the subtitle ‘Psalm 130’ which begins, ‘Out of the depths I have cried unto thee, O Lord. Lord, hear my voice: let thine ears be attentive to the voice of my supplications….’ The beginning of this piano piece evokes the hopelessness and cry for help which opens Psalm 130. The development of this melody perhaps portrays verse five, ‘I wait for the Lord, my soul doth wait, and in His word do I hope.’ Beach builds to a climax of petition, with a flurry of notes adding weight to the plea for help. The piece ends quietly, in full submission to a greater will beyond human understanding. Improvisations, op. 148, 1-5 were written by Amy Beach at the MacDowell Colony at the age of seventy. She wrote to a friend that they were, “really improvised” and that each “seemed to come from a different source.” The first, in ternary form, atmospherically explores augmented and diminished harmonies from the opening pitch A, the phrases through-composed and sequentially moving forward, finally reaching A major in the last bar. About the second improvisation Beach said she was remembering how she “many years ago sat with friends in an out-door garden outside Vienna and heard Strauss waltzes played.” The third improvisation is marked Allegro con delicatezza and consists of a playful melodic pattern over a light chordal accompaniment featuring extended harmonies with quartal implications. This is followed by a very slow piece of three long phrases, each beginning the same but then diverging in their quest, a pure G-flat major resolution only being found in the last bar. The last improvisation is a sort of kujawiak, a slow mazurka with the emphasis in this piece being primarily on the second beat of the bar. The grandeur of the opening develops with broad chords and full use of the range of the piano, the fff climax subsiding into a pp restatement of the opening. What a glorious cycle this has been. Volume 2 was one of my Recordings of the Year 2009 and its successor very nearly made it to last year’s list. Beach was new to me first time around – as was Kirsten Johnson – but the thrill of discovery was undiminished with Volume 3. I certainly hoped this final instalment – The Late Works – would be as rewarding as its predecessors, both musically and sonically. Seconds into this disc and it’s clear this is going to be yet another treat. Johnson’s intuitive, unassuming pianism is backed up by a recording of clarity and poise. As Johnson avers in her lucid liner-notes – which strike a very good balance between description and analysis – the restless Nocturne is anything but a dreamy interlude. Beach’s writing is direct and unsentimental, with just enough harmonic sweetness to prevent the music tipping into unwelcome aridity. The Wyastone Leys acoustic brings out Johnson’s emphasis on articulation and focus. The rhythms and stentorian chords of the Tyrolean waltz-fantasy superbly wrought. That’s not to suggest a lack of charm or loveliness; the latter quality is omnipresent in The Old Chapel by Moonlight, whose soft meanderings are very atmospheric indeed. Ditto the sleep-inducing rock-a-bye of A Cradle Song and the mesmerising crystalline quality of By the Still Waters. There’s an acuity of observation in Beach’s writing, underlined by the aphoristic but characterful miniatures that make up From Six to Twelve. I had to marvel at the easy rhythmic strokes of Canoeing, the point and animation in Secrets of the Attic and the warmth of A Fire-side Ceremonial. What a powerful sense of communion, of simple gifts gratefully shared. Also, style and content are always in equilibrium; the Boy Scouts March is small but perfectly formed. It’s all magically played and so beautifully recorded. I just can’t imagine Beach’s legacy better served than it is here. There are two keen intellects at work in this repertoire; Beach, who balances outward pictorialism with disarming inner discipline, and Johnson, who responds to – and so gently reconciles – these subtle tensions. Just sample Young Birches, which combines suppleness and sinew or the brief shimmer of A Humming-bird. Even in Out of the Depths there’s a pleasing balance between scale and effect. Musical seams are never mined to exhaustion and programming – so important in anthologies of this kind – ensures telling changes of mood and tempo. Some of the most pellucid writing can be found in the Five Improvisations. Surely this is a distillation of all that’s gone before. Easeful and inventive, this is music and music- making of joy and contentment. Indeed, as artistic summations go this could hardly be more impressive. Despite attempts to roll back women’s rights, the last few decades have seen marked improvements musically for the ladies in this country. 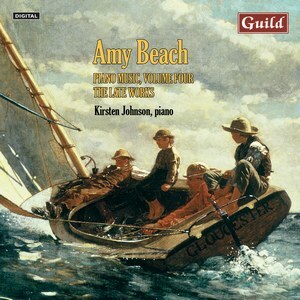 Who would have thought a few years ago that Amy Beach’s piano music would have been represented by not just one, but several recordings? Virginia Eskin, from the Boston area, was a pioneer in promoting Amy Beach on several recordings. While she presented us with a fair representation of the music, either circumstances or choice prevented her from completing the series. Her performances were far more than serviceable, and her advocacy and pioneering spirit is much appreciated, though the reviewer thought less of the music (M/J 1996). Joanne Polk, on the Manhattan School of Music faculty since 2010, gave us the first complete series of the piano music and even extended it to include the Piano Concerto and the chamber music with piano. Those are recordings to treasure. Harold Schonberg’s reviews were favorable to both music and performance (N/D 1997, J/A 1998, M/A 1999). Kirsten Johnson was born in Virginia but now resides in Oxford, England. Remaining true to her American roots she embarked on recording the complete piano music in 2006. This is her latest volume, and her dedication has managed to turn up a few pieces not included in Polk’s series. Whether her advocacy will go beyond the solo music remains to be seen. What we have so far is fully up to the high standards set by Eskin and Polk. Only the first volume appears to have been covered in these pages (J/A 2008), and the reviewer felt the earliest pieces not worthy of repeated hearings. I must confess to liking this music, as Mr Schonberg did. If nothing reaches masterpiece status, it never aims for those lofty peaks. If you like the short pieces by MacDowell and his contemporary New Englanders, you will most likely respond well to the music of Amy Beach. There is charm aplenty, grace, and all the vivacious technical savvy one could ask for. What’s more, occasional good tunes appear— surely not something to sneer at these days. The excellent notes, by the pianist, point out Beach’s “long term relationship with the Mac-Dowell Colony, spending much happy time composing”. Since her life extended many years beyond MacDowell’s, it is not surprising to find some Impressionist harmonies in her color palette.